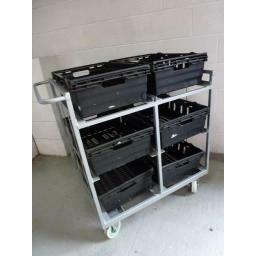 New Picking trolley for Internet orders, warehouses and packing houses. We had picking trolleys very similar to these ones which we brought in second hand they sold like hotcakes so we have souced a new picking trolley. Unfortunately our source of second hand picking trolleys dried up so this is currently the only option we have. The trolleys are brand new but the tote baskets are used. We make sure they are clean and undamaged prior to shipping. In the workshop we can fit an A4 clip board to the handle for order paperwork. Occasionally we have this trolley in stock in a used condition at a discount. If you are interested then do call or email us and we can confirm stock availability.